Many of us are fascinated by dragons and we go out of our way to find out all we can about these extraordinary creatures. There are many different species which, though they have basic similarities, are very unalike. For example the Asian dragons are, for the most part, "benevolent, friendly, and wise" and are therefore quite unlike their European counterparts which are rather inclined to eat any humans that they come across. Because we are so interested in them, many of us love to draw dragons. However dragons are not the easiest of creatures to draw. 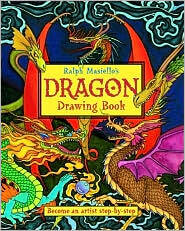 Thankfully Ralph Masiello has created this book which teaches us draw eleven different kinds of dragons. For each one he gives us a story or background information about the dragon in question. And, of course, he shows us how to draw the animal. For the colored-in final drawing with its background picture he tells us what kind of tools he used. He also provides us with additional drawing tips to help us make our dragon pictures extra special. Thus we are able to try our hand at creating, among others, a Mayan Celestial Dragon, an English Lambton Wyrm, a two legged Wyvern, and a glorious Chinese Imperial Dragon. With excellent illustrated directions and an entertaining text, this how-to drawing book is sure to delight artists and dragon fans alike.